Center de Cultura Contemporània de Barselona announces the pre-selection of projects for the European Prize for Urban Public Space 2018. We invite you to send applications describing the public spaces that were created in the cities of Ukraine during 2016-2017, until November 5 including. With ideas of equality, plurality and progress constituting part of its very foundations, the European city is today facing new challenges arising from its exponential growth and increasing social and cultural complexity. Some of society's main problems are expressed in its public spaces: segregation, rampant construction and deficiencies in guaranteeing the rights to housing and to the city are some of the phenomena that are putting into jeopardy the ideal of the open and democratic community that has always been so distinctive of the European city. The criteria that will govern selection of the projects that are presented for the European Prize for Urban Public Space will not be exclusively related with the quality of the work from a strictly architectural point of view. The jury will also consider other aspects that enable evaluation of the urban transformation that has taken place in the specific setting. The explicitly urban nature of the intervention. The size of the city or town is not a limiting factor although priority will be given to medium-sized or large municipalities and those with a more general urban significance. The public ownership and/or clearly public-spirited vocation of the project. Appropriateness of interventions to the functions required of public space, from those directly linked with citizens' occupation of a space, through to those pertaining to the collective imaginary. Capacity of the interventions to reduce social fractures within the city and eliminate physical and/or symbolic barriers in order to enhance quality of life for the inhabitants. Contribution of the projects in the domain of environmental improvement, in promoting public transport and innovation in the treatment of public installations, energy resources and urban waste. The degree of citizen participation and engagement in the conception, carrying out and/or subsequent maintenance of the space. Degree of acceptance by users. Transversal character of the planning concepts and/or objectives that have guided the project (sociology, demography, history, architecture, economy, engineering, landscaping, anthropology, etc.). The three numbered DIN A3 panels in PDF format. Technical data of the work. A minimum of 10 JPG images (photographs and drawings). Descriptive report, written in English, approximately 4,500 characters long, in four chapters (previous state, aim of the intervention, description and assessment). 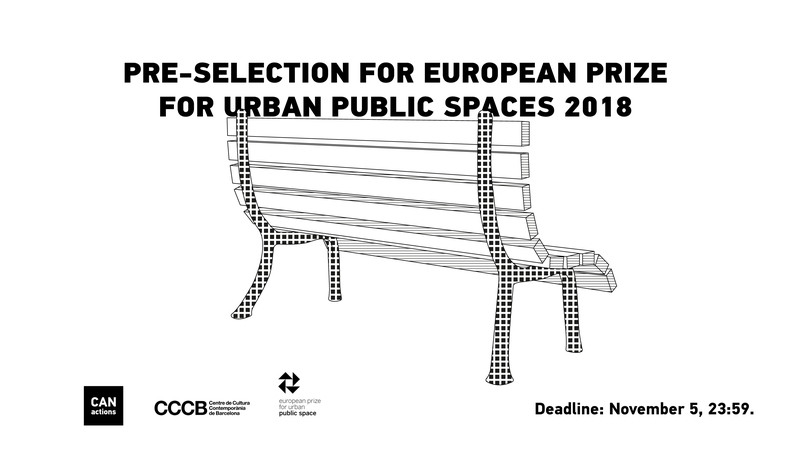 Send your applications to info@canactions.com with the subject "European Prize for Urban Public Space 2018"